When it comes to tree care, we might be slightly biased, but our rule of thumb is, when in doubt, call in the professional tree care experts. Now, being “in doubt” can look like a lot of different things. But in fairness to our clients, we don’t want you paying for tree care services you could easily perform on your own with just a smidgen of guidance. For instance, taking care of your mature, healthy trees already found on your property is not always a job that requires a “tree doctor”. Sometimes it does, like when you need experienced hands and eyes on a tree pruning job, a pest control task, and even planting or removing a tree. You should know, while we are talking about it, that those services just mentioned are some of our most common jobs performed in the Ashburn, Vienna, Alexandria, Fairfax, and surrounding regions. In today’s post, we are going to stray away from describing our tree maintenance services, because we are an arborist company that wants you to be successful in learning how to care for your trees on your own. With that in mind, read on if you are interested in educating yourself on how to care for full-grown and mature trees. We hope you find these quick-hitting tips to be helpful and practical! Generally speaking, most trees live longer than the humans tending to them. More accurately, trees tend to live longer if they aren’t in a residential neighborhood. But rather than guilt-tripping our readers for having trees in their yard, that would be messed up, we’d rather encourage you with practical tips that can increase the lifespan of your favorite tree, even if it lives in an urban environment. With just a few maintenance tips, you can do exactly that. Let’s start with trees that may not be in tip-top shape at the moment. There are several warning signs that can indicate this state of being, all you have to do is know what to look for. Look to see if your leaves are showing dark blotches, are withering, off-color, undersized, or are just plain withering? It doesn’t take a tree doctor to diagnose the latter point, but just keeping a watchful eye open is 90 percent of the battle. Cracks in the trunk are not a good sign. Also bad are holes in the trunk. This might be a pest issue, which can also look like chewed leaves, holes in branches, buds that aren’t sprouting, or even sawdust. Unfortunately, all we can do is tell you what to look out for in this case. It’s a safer bet to call in the tree pest control experts for a problem like this. Ivy vines growing up the trunks are also something you want to nip in the…bud. Ivy is nasty because it takes away water from the tree, and can also sap your favorite tree from getting indispensable nutrients. Ivy is greedy. Say no to ivy. If a storm has damaged your yard and trees, we are sorry. That is no fun to deal with. Often times, people are so busy dealing with branches and limbs that have fallen (not to mention potential structural issues the storm afflicted your home with) that they fail to realize their tree’s health might be at stake due to soil compaction. Soil compaction happens to be one of the chief tree killers in cities and towns, because it suffocates the roots. Again, to be sure of the situation and the long-term health of the trees in your yard, call Growing Earth Tree Care for comprehensive tree service. Keep in mind that if the storm was so bad that you need an emergency tree removal, we are only a phone call away. Okay, let’s talk about preventative measures for tree care, rather than solely focusing on diagnosing already existing problems. At the risk of sounding somewhat obvious, let’s start with some basics. Water your trees during dry spells. Surprisingly, many homeowners love to give their beautiful green grass plenty of water but fail to do the same for trees. If you are concerned about over-watering, a decent rule to remember is to give your trees a drought any week it doesn’t rain more than 1 ½ inches. That kind of week occurs more often than you’d figure, so we recommend being cognizant of that fact. The adage “the more the merrier” rarely applies in any practical application, with the possible exceptions of money and whiskey. One case that certainly isn’t an exception is mulch. When you place mulch around your tree, you are attempting to conserve moisture within the soil, to help create an environment in which your trees never get too thirsty. Placing mulch around your trees also can help protect the tree’s bark from damage, but sometimes we see our clients get over-zealous in their mulch distribution. Specifically, placing mulch around the trunk itself is not a good idea, as it can cause rot to the base of the tree. Rot is bad, and eventually might even kill the tree. You’re not a tree-murderer, are you? Go ahead and place between 2-3 inches of mulch around the tree, and you’re all set. Great job! Many of the warning signs we mentioned above apply to this paragraph’s category, meaning you’ll want to call in Growing Earth Tree Care if you notice dead branches, eaten leaves, holes in the trunk, and so on. Additional signs that you might be out of your league (there’s no shame in that, that’s why exist as a tree company) are as follows. Leaves either blossoming and coming out later in the year than usual or dying and falling sooner, or, both. Weird looking bark, meaning it has bumps, is split, or is peeling off. Fungus growing around the trunk, mushrooms sprouting up where the roots are, or even branches sprouting from the trunk itself. That is a sign that something is dying somewhere in the tree, and we can usually help with that kind of problem. We failed to mention pruning specifically in this article, yet it is a topic which we have covered in some detail before. Pruning is an essential aspect of tree health, so be sure to browse back through our posts to find some practical advice on that issue. When considering your options for enlisting the services of an arborist, allow us to make a case for our local tree care company, Growing Earth Tree Care. 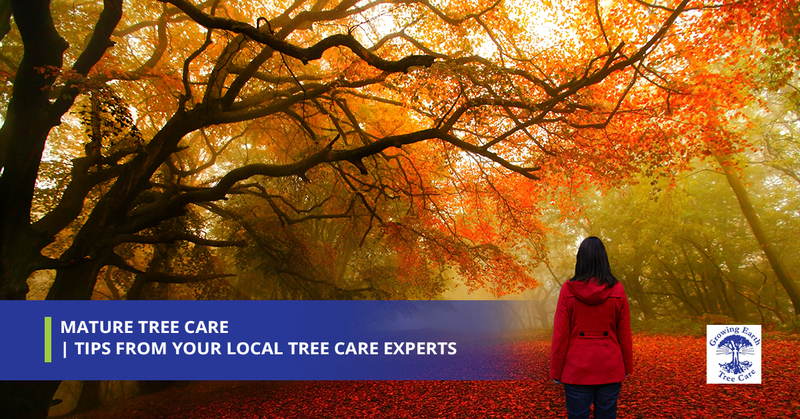 Virginia’s Top Rated Local tree care experts offer award-winning tree preservation and maintenance, and have been since 1976. Being in business for over 40 years means we are doing something right, and we ask you find out what exactly that “something” is. Whether you are looking for tree removal services, tree pruning, pest control, or another tree service, feel free to fill out this form so you can get a FREE estimate on the job you want done. We care about our community, and love to help you in any way we can. Reach out to us today!